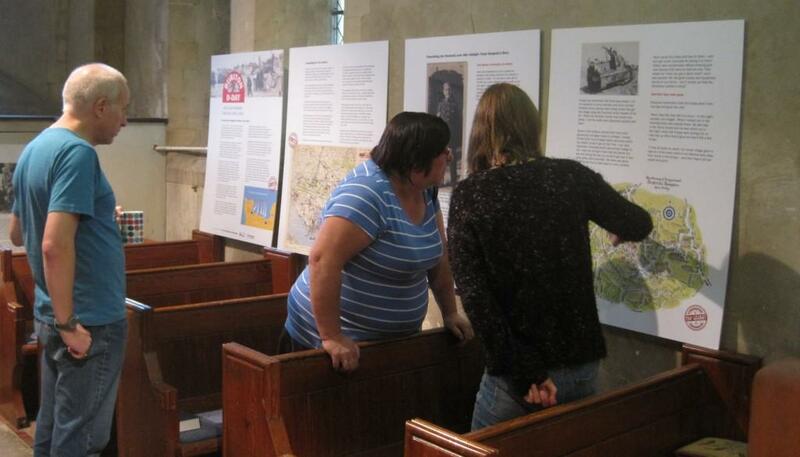 Almost 200 visitors flocked to Buriton church on Saturday 27 th September 2014 for the annual ‘Bygone Buriton’ exhibition – including families from across the country. People always seem to love to come back to see their family roots and chat with long-lost friends and, as usual, we were able to make copies of more old photos and other information for our records. We now have almost 3,000 images in our archives. Amongst the new information brought to the exhibition this year was a first-hand account of a major fire in Weston in about 1940. Roy Pinhorne from Paulsgrove recalled that he had been evacuated from Portsmouth to stay in the hop-pickers huts in Weston whilst the city was being bombed. There was great interest in the new wartime information which was displayed this year. Memories of the build up to D-Day around the parish were recalled and heroes of the First World War were also recognised with a special presentation about all the men who had joined the forces. Almost 200 men had gone away at some time during the war – out of a total population of less than 800. We want to find out what living conditions were like at home during the First World War, as well as finding out more about every one of the parishioners who took part. We hope that some families may have letters, diaries and photographs that may help us – and we hope that more people will get in touch.